Prime Minister Justin Trudeau talks with Tla-o-qui-aht Chief Councillor Elmer Frank. Trudeau last year he was not welcome back in the territory. Trudeau had vacationed in Tofino last summer, and even took part in a parade celebrating Tla-o-qui-aht First Nation. But in September 2016, Chief Councillor Elmer Frank took part in yet another frustrating and futile meeting with fisheries officials on the implementation of the Nuu-chah-nulth commercial fishing court win of 2009. There has been eight years of "negotiations" since. At that time, Nuu-chah-nulth Nations asked Fisheries and Oceans staff, including Regional Director General Rebecca Reid, to leave the meeting immediately and not come back until DFO had a clear mandate from Ottawa to negotiate. It was then that Frank decided to write the Prime Minister telling Trudeau his government and bureaucracy needed to reflect on the Prime Minister’s own promise of reconciliation with the First Nations. Until they did, Trudeau was not to come back to Tla-o-qui-aht territory. Frank told Ha-Shilth-Sa, a newspaper published by the Nuu-chah-nulth Tribal Council, that the Nation decided to extend the welcome to Trudeau after seeing efforts of reconciliation from his government. 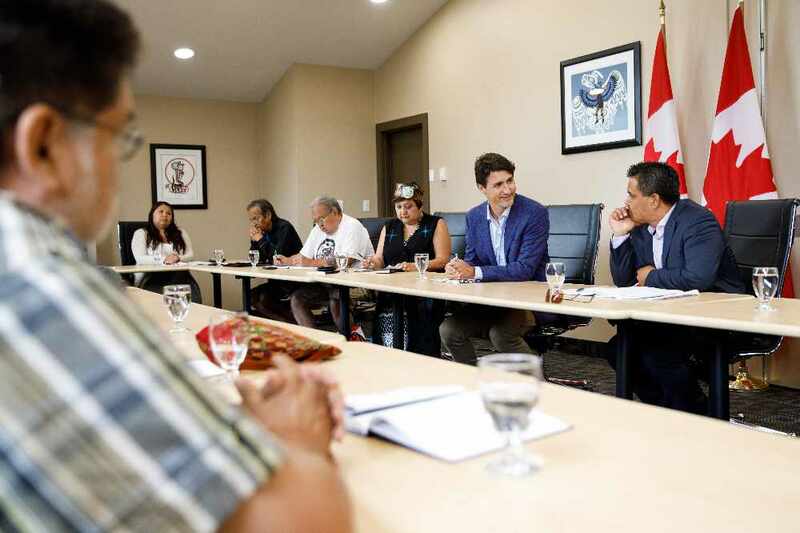 Tla-o-qui-aht joined 11 other Nuu-chah-nulth Nations around the table with Trudeau, along with representatives of the Nuu-chah-nulth Tribal Council (NTC). In a statement released today, NTC said it was confident that Trudeau was open to receiving feedback and recommendations from all 14 Nuu-chah-nulth Nations and had committed himself to follow-up. The meeting discussions centred on treaty negotiations and implementation, the T'aaq-wiihak Fisheries court case, reconciliation and improving the quality of life for First Nations, as well as building the capacity of the Nuu-chah-nulth, and the possibility of increased funding. It was a historic meeting as it was the first time any Prime Minister had met with the collective Nuu-chah-nulth Nations in their territory on the west coast of Vancouver Island.